Section 3.1. The Premises may be used only for Tenant's general offices, and for related uses incidental or tangential thereto. Section 3.2. Tenant shall not use or suffer or permit any person to use the Premises or any Improvements at any time situated thereon for any use or purposes in violation of any Requirements or in any manner that would violate any certificate of occupancy affecting the Premises, or which would cause the value or usefulness of the Premises or any part thereof to diminish, or that would constitute a public or private nuisance or waste, and Tenant covenants that it will, promptly upon discovery of any such use, take all necessary steps to compel the discontinuance of such use and to oust any Subtenants or other occupants guilty of such use. (c) Tenant shall have indemnified and shall continue to indemnify Landlord with a surety bond, or other means satisfactory to Landlord in its sole discretion, in an amount sufficient to pay any fines, penalties or other charges that may or might be assessed against or become a charge on the Premises if such contest is unsuccessful. Any such contest may be made in the name of Landlord or Tenant or both as Tenant shall determine; and Landlord agrees to cooperate reasonably with Tenant in any such contest but without expense to Landlord. Tenant shall pay all costs and expenses (including, but not limited to, Landlord's attorneys' fees) incurred by Landlord in connection therewith. If Tenant upon the conclusion of any contests or proceedings shall fail to pay any fines, penalties or other charges thereby determined to be due, or if prior thereto Landlord, in the exercise of its sole judgment, shall determine that either condition (a) or (b) of this Section 3.3 is no longer satisfied, Landlord may apply all or any part of any security provided under this Section to the payment, removal and discharge of such amounts and any costs, expenses (including, but not limited to, Landlord's attorneys' fees) and other liabilities accruing in such proceedings, and shall refund to Tenant the balance of any security not so applied, if any. Tenant shall promptly pay to Landlord any deficiency resulting from such application, with the amount of such deficiency to be due as Additional Rent due on the next rent day after any such deficiency is determined, with interest thereon at the rate of Prime plus three percent (3%) per annum from the date of such determination. Section 3.4. Tenant shall not suffer or permit the Premises or any portion thereof to be used in any manner as might tend to impair Landlord's title to the Building or Land or any portion thereof, or in such manner as might make possible a claim or claims of adverse usage or adverse possession or of implied dedication of the Building or Land or any portion thereof for public use. Section 4.1. 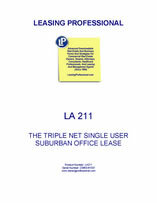 Landlord and Tenant agree (a) that this is a triple net lease, (b) that Tenant accordingly shall be responsible for all obligations which are normally imposed on the owner of real estate with respect to the Premises which may accrue during the Term including, without limitation, responsibility for the payment of all real estate taxes, special assessments, insurance premiums and repair, replacement and maintenance costs and expenses in connection therewith (except as otherwise expressly set forth herein), and (c) that the Rent and all payments to be made to Landlord hereunder are to be net to Landlord, without deductions or offsets of any kind or nature whatsoever. In no event shall there be any abatement or reduction in the Rent except as may be otherwise specifically provided in this Lease. Section 4.2. Except as otherwise specifically provided herein, damage to or destruction of any portion or all of the Building or other Improvements located upon the Premises, by fire, the elements or any other cause whatsoever, whether with or without fault on the part of Tenant, shall not terminate this Lease or entitle Tenant to surrender the Premises or entitle Tenant to any abatement of or reduction in the Rent payable, or otherwise affect the respective obligations of the parties hereto, any present or future law to the contrary notwithstanding. If the use of the Premises for any purpose should, at any time during the Term, be prohibited by law or ordinance or other governmental regulation, or prevented by injunction, or if there is any eviction by title paramount, this Lease shall not, except as otherwise specifically provided herein, be thereby terminated nor shall Tenant be entitled by reason thereof to surrender the Premises, or to any abatement or reduction in Rent, nor shall the respective obligations of the parties hereto be otherwise affected unless such eviction is due to the act of Landlord or any person or persons claiming any interest in the demised premises by or under Landlord. Section 4.3. This Lease is made upon the foregoing and following covenants, agreements and conditions, all of which Tenant agrees to perform irrespective of whether the particular provision is in the form of a covenant, an agreement, a condition, a direction or any other form.